Six Sigma changed the face of manufacturing quality. Now, HumanSigma is poised to do the same for sales and services. 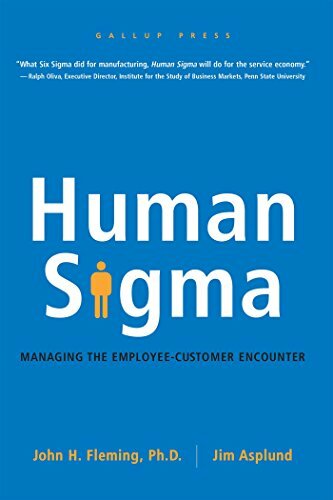 Human Sigma offers an innovative research-based approach to one of the toughest challenges facing sales and services companies today: how to effectively manage the employee-customer encounter to drive business success. What would your company look like if you could increase the revenue and profitability potential of every customer by more than 20 percent? What if you could double the productivity of every employee? And what if these two phenomena together could drive overall organizational performance exponentially? What would your company look like? And how would you go about creating this kind of change? One thing is certain: Business leaders are never going to inspire higher levels of employee productivity and build more passionate customer relationships by doing the same things they have tried for the past 25 years. Business leaders need something fresh. Something new. The last thing they need is more of the same old conventional wisdom about “satisfying” their employees and their customers. · Rigorous: Based on research involving hundreds of companies, and over 10 million employees and 10 million customers around the world. · Innovative: Cutting-edge management science supported by data, including brain imaging research into customer’s emotional connections to the companies they love. · Practical: The principles in the book were developed from observations of real-life successes, not some fictional freaks-of-nature that exist only in a laboratory. As such, the lessons contained in the book have been tested in the real world, and can be applied in many situations. · Interactive: The book contains a code that can be used to estimate the potential value of HumanSigma to readers’ organizations. Prior to joining Gallup, Fleming spent six years as a member of the psychology faculty at the University of Minnesota. He received his doctorate in social psychology and master’s degree in psychology from Princeton University and his bachelor’s degree from the College of William and Mary in Williamsburg, Virginia. He lives near Princeton, New Jersey, with his wife, Robin, and their twin daughters, Allison and Emma. Jim Asplund is The Gallup Organization’s Chief Scientist for Strengths-Based Development. He leads Gallup’s global research on the science of human strengths, and how to apply them to improve organizational performance. His consulting expertise focuses on how strengths, employee engagement and customer engagement interact to drive financial performance. Jim is also one of Gallup’s leading methodologists, specializing in complex research and development efforts. Prior to joining Gallup, Asplund spent eight years as a lobbyist and policy expert at the Minnesota Legislature, representing clients in the areas of taxation, education funding, utilities, land use, and economic development. Asplund earned his bachelor’s degree in mathematics from Grinnell College in Iowa and his master’s degree in public policy with emphasis in mathematical demography from the University of Minnesota. He lives near St. Paul, Minnesota, with his wife, Susan, and their sons, Jakob and Jonas.